Today I ship out the biggest box I could find filled to the brim with weeks worth of secret project making, so much hard work, and most of all excitement & pride. I can't wait to be able to share more with all of you very soon! There's such a wonderful release that comes after checking that final task off a lengthy to-do list. This one called for some celebrating, and insanely enough for me that means more sewing! Well, some carefree sewing for one of my very favorite little people, my niece Sylvia who LOVES her some purple! 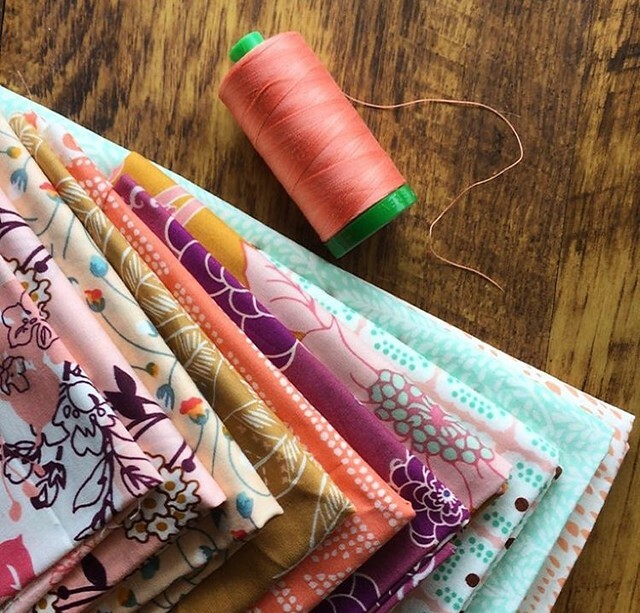 During a FaceTime chat, with her expert taste & guidance, I pulled a new collection of fabrics from my stash to make her a little baby doll quilt with just enough purple to gain her approval. I promised that if she had her Mama check this blog today when she woke up (Hawaii time) I'd have pictures waiting here to show her. So here I am today, sharing my newest baby doll quilt, with purple! Since I don't really have many purple prints in my stash, a lavender binding and purple backing fabric was key! 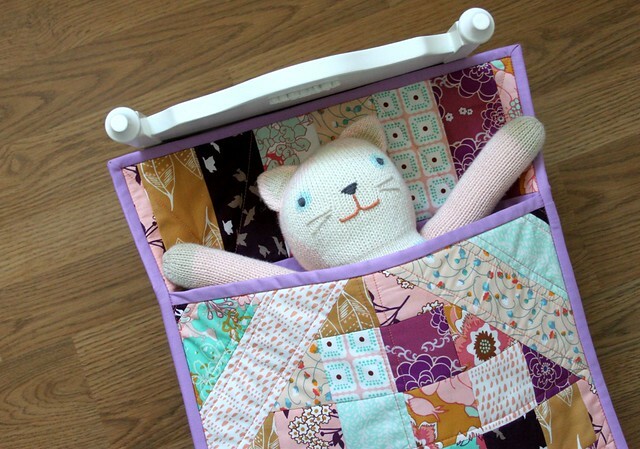 Just like the first, I made this doll quilt in a sleeping bag style to fit one or two dolls comfortably! 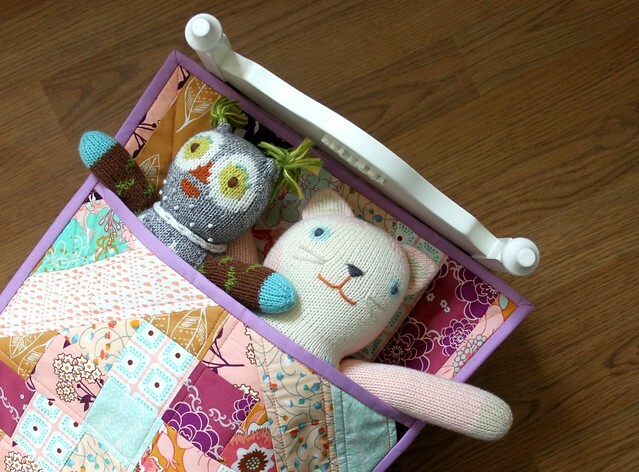 Besides being super cute and an enjoyable sew, these doll quilts make great practice for new patchwork ideas. I think this design is destined to become a larger quilt, soon! p.s. I love you, Sylvia! Your niece has excellent taste! Purple is a beautiful color. Your quilt design is pretty and would make a spectacular quilt. Thank you for sharing and have a wonderful creative day! That is just adorable! I bet your niece will be so happy! So sweet! 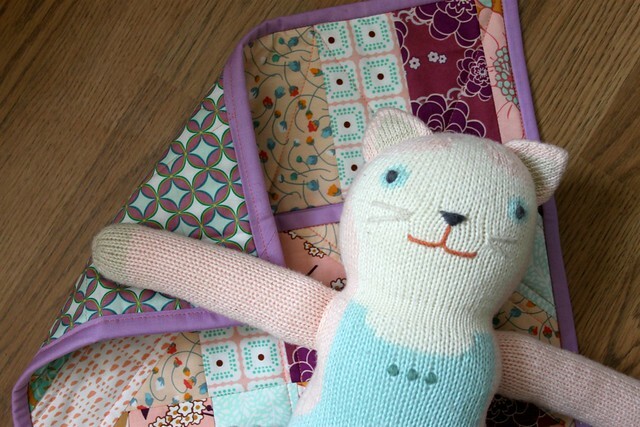 I love sewing for little ones! My 3 year old little lady is also a purple lover... she thought this was boootyful!! Oh such a sweet quilt. I also love that bed frame. Did you make it or buy it? Unbelievably cute! Where can I see the first one you made? Sylvia said "Thank you Aunt Maureen for the quilt it is wonderful. I love it so much. I love you so much. I miss you. You make the best quilts ever. Dear Sylvia"
So precious! Love that you and she worked together to make something so special. 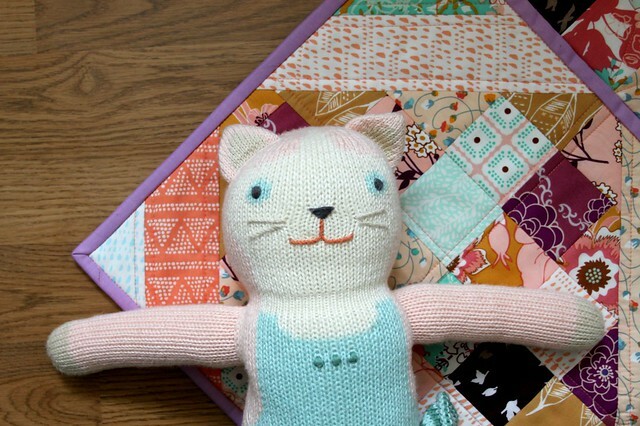 And love the kitty dolly. My six year old finished her first quilt in July and is starting her 2nd quilt. 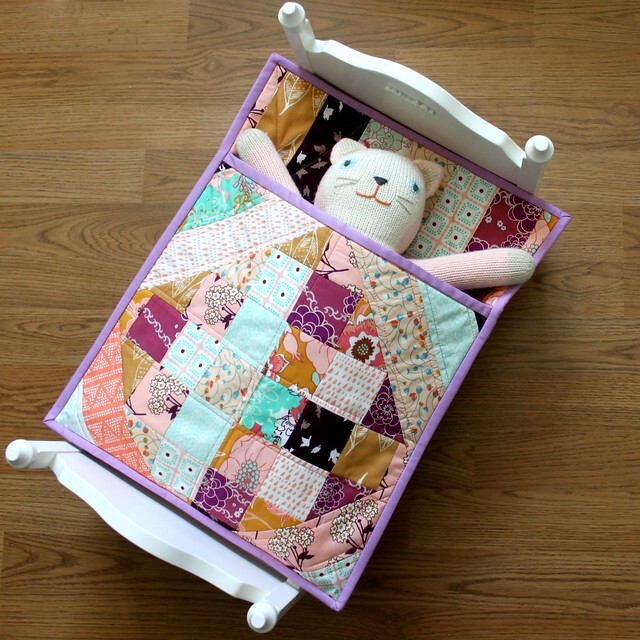 This baby doll sleeping bag quilt would be such a fun project for her. Any tutorial on sizing and final putting it together? I do hope to share a tutorial at some point. The finished quilt is 14" x 18." Can I ask where you get all of these cute knit dolls? The quilt is precious by the way! I'm loving the purples. This is lovely.